Drayton (left) and Khan battle during their match. 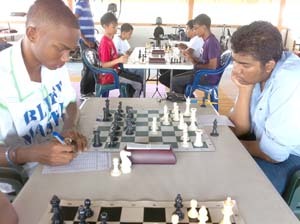 Senior Champion Taffin Khan and seasoned junior Anthony Drayton are jointly leading the TOPCO Juices Republic Anniversary chess tournament which began last weekend at the KEI-SHAR’S Sports Club in Georgetown. During their encounter, Khan and Drayton played to a drawn position in an endgame with only rooks and pawns remaining. Drayton offered the senior champion a draw and Khan accepted. Apart from the draw, the two players have both won three matches contested with other players. Drayton defeated top senior player Maria Thomas before his match-up with the senior champion. The points standings after four rounds read: Taffin Khan and Anthony Drayton three and a half points each, Maria Thomas and Cecil Cox three apiece, while the remaining players have scored two and a half points or less. The two leading participants along with others from Diamond Secondary, St. Rose’s High, Marian Academy, Queens College and the senior players will clash again this weekend. The final four rounds of the eight round tournament will be contested over the chessboard and the top performers, including the best newcomer will emerge. The tournament is being sponsored exclusively by Demerara Distillers Ltd. under its TOPCO Juices brand.